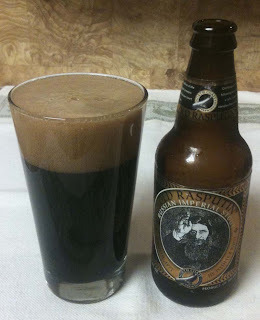 Today I will have an Old Rasputin Russian Imperial Stout from North Coast Brewing Company. The twelve ounce bottle lists 9% ABV. The web site shows 75 IBUs. This beer poured with a thick, rich brown head that looked like milk chocolate. The beer color is a very dark black or brown, with no light showing through the glass. The aroma has roasted malt, cocoa and brown sugar. The taste is not as strong as you might expect. Cocoa, roasted malt and a definite sweetness. Maybe just a little coffee. 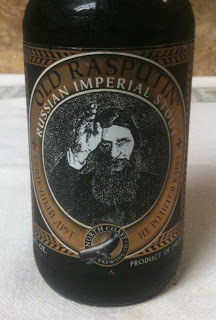 A hint of the higher alcohol comes in at the end; leaves you with some warmth. Just a little thin in the mouth feel department at the tail end. The aftertaste leaves you with a little dark chocolate bitterness. For the style and higher alcohol, this is actually a pretty easy drinking beer.